Standard Insurance: (You can choose your doctor and don't need a referral) We participate with all insurance plans of this type. PPO Insurance: (You can choose your doctor but generally need a referral) We participate with all insurance plans of this type. HMO Insurance: (You are required to see a doctor in the HMO Plan) We participate with several plans but it is very specific and it would be best to call our office to confirm if we are on your plan. Medicare: (Generally those over 65 years of age) We participate with medicare fully. Medicare with Medicare benefits signed over to a HMO: Some people choose to designate all of their Medicare benefit over to a HMO. Generally we do not participate with these plans. Vision Insurance: (For example, VSP and Eye Med) Some of our doctors participate with these plans. This type of insurance is for eye glasses and contact lenses. If you have any eye problems then your medical insurance covers the exam. 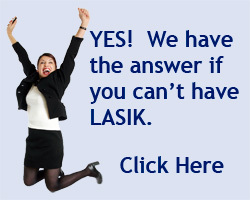 Many of these plans will help pay for your LASIK vision correction in our office. Complete List of Participating Insurance Plans as of April 2010.